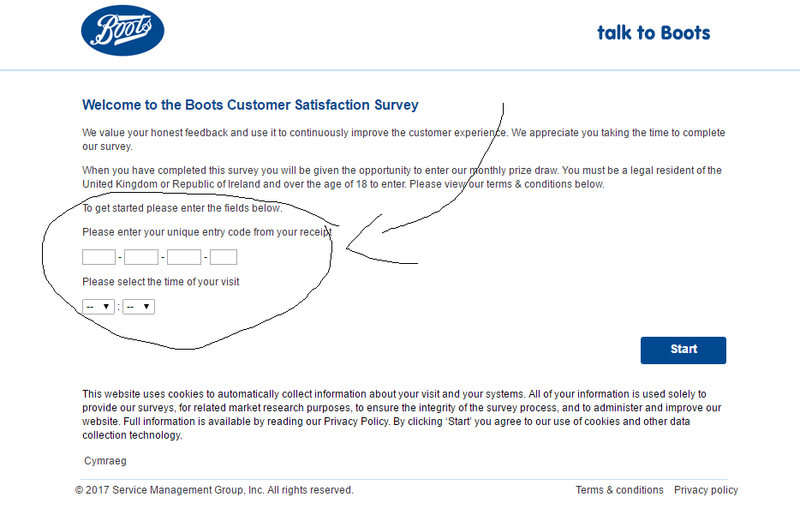 In order to start the Talk to Boots survey the customer must input the unique entry code from their Boots customer receipt along with the time of visit. This entry code will be located at the bottom of the Boots receipt and will be 15 digit long. Customers who tossed the receipt in the trash can will not be able to take the survey unless they memorized the entry code. Once the entry code has been provided the customer will be asked to answer a few short survey questions in regards to their Boots visit. These questions will revolve around the quality of the products and the friendliness of the employees. Boots ask that the customer provide their HONEST feedback… good or bad. The Service Management Group will be in charge of collecting all survey data and delivering to the general managers in charge of each Boots location. Once the customer has finished answering all the bothersome questions they will be entered into the Talk to Boots customer survey prize draw. In order to qualify for the draw the customer must be 18 years of age or older and a legal resident of the UK or the Republic of Ireland. The survey sweepstakes drawing will take place around the 10th of each for the previous month. No purchase is required in order to enter the sweepstakes and the winners will take home a iPad Mini. TalkToBoots.com is operated by the Service management Group in agreement with Boots. Prizes cannot be redeemed for cash and cannot be transferred.